Hi crafters. I don’t know about you but I love flowers and frankly, I am too scared to count how many flower dies and templates I have; yet somehow, I can always find a need for more. 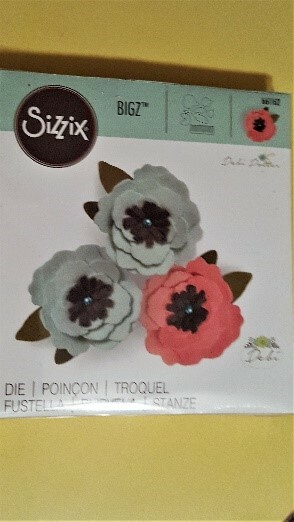 I recently bought a new Sizzix flower die (pictured right) and as usual couldn’t wait to start playing with it. After buying a new die, I usually cut everything out in scrap card and start playing with the pieces, moving them around to see how the die works and how many different ways I could adapt the shape for differing uses. I made up a flower out of card and loved it, so I wanted to see how it looked in fabric so I found some scraps of fabrics and started cutting. I put different types and thicknesses of fabric through my Sizzix Big Shot Plus as I wasn’t sure if thinner fabrics would hold up the flower form as well. I got quite carried away with the cutting and ended up with lots of petals, especially in the cottons as my Sizzix Big Shot Plus easily cuts six layers of cotton at once so you can get through many cuts at once. The way the Big Shot Plus cuts through so many materials with ease is why I love it so much. I spent the evening making flowers with the fabric, experimenting with mixing colour tones and textures. 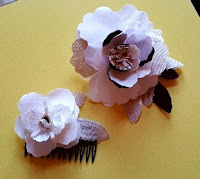 I could’ve kept the flowers to use as embellishments on cards, home décor or other fabric projects at a later date, but as I was playing the word ‘fascinator’ kept calling out at me. 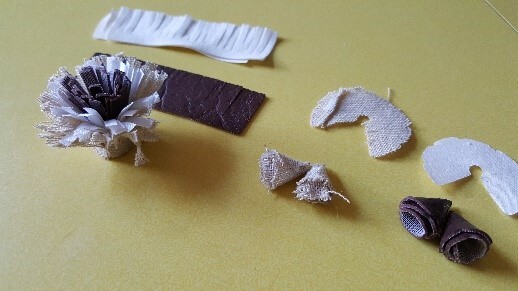 The flower die consists of several parts that make up the flower and the die will need to be passed through at least three times in your chosen fabric so you’ll have enough parts to makeup the one in the picture. 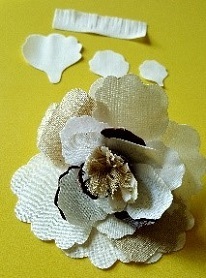 For speeds sake – I glued the parts of the flowers with fabric glue. I started by coiling the fringed strip round in quite a tight circle and glued it at the bottom to fix in shape. I then added the smaller of the petals to the coiled fringe strip gluing the bottom of the petals to the bottom of the coil, how many petals you add is completely up to you and different combinations of sizes and the number of petals in that size you use will give you plenty of variations and versatility. I have even coiled the small split circle to create a bud or different centre to the flower. When wrapping and layering the petals it can make them form more naturally if you offset the petal against the one beneath it. Also, like with many designs, odd numbers in petals and flowers can work well. 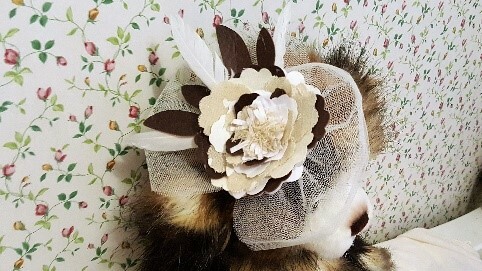 For the large flower in the fascinator – I used faux leather, linen, hessian type fabrics, and cream and white fabric left over from lining curtains, this is a good stash-buster project. 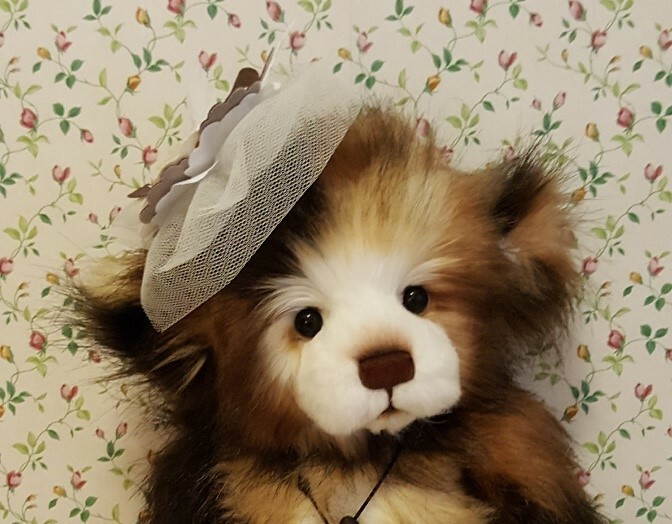 I knew that I wanted to use some netting for the fascinator but you could use other embellishments such as ribbons, lace, diamante, pearls and feathers. I couldn’t resist adding a few feathers. I made my flower quite large so I needed quite a few petals but the beauty of this die is that it will adapt to the size you need. 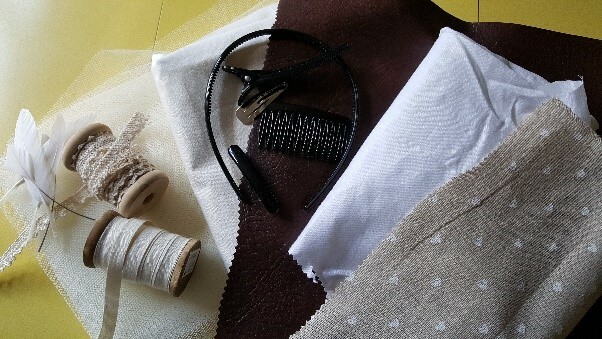 I enjoyed mixing in different cream and chocolate tones as well as mixing textures. When I finished layering up the flower I used a split circle cut shape to wrap around the bottom of the flower that forms a cone-like cup to beaten up the back of the flower. The flower die also cuts out a leaf shape that can be used as it is or be cut down into smaller, individual leaves to compliment your flower. To make the netted backdrop to the flower I cut about half a metre long strip of netting about 20cm high, I used two of these strips. I folded the strip of netting down from 20cm to 10cm and then stitched across the width of the strip (the non-folded side) to gather. To create a more interesting and neater end to the netting I cut a curve down from the fold to the bottom, this can be done before or after you gather the netting. 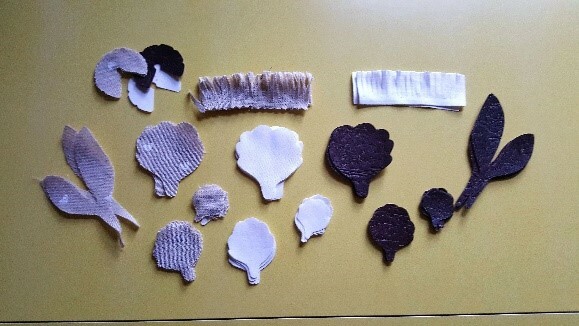 Repeat with the other strip and you should end up with two kidney shaped pieces. 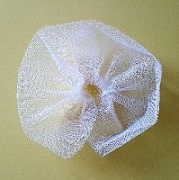 I overlapped one piece of netting with the other so they fit nicely into a curve and form almost a circle of netting. I stitched the netting in place. 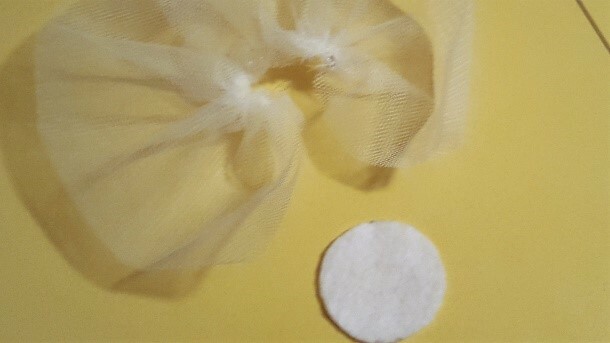 I cut a small piece of felt into a circle that I could use as a base to stick the netting to. To glue the netting, leaves and flower in place and sticking the whole piece to the hair band I used a glue gun as its strong and ‘grabs’ fast. Depending on the embellishments and where you want to use them they can be added before or after the flower is fixed to the netting. 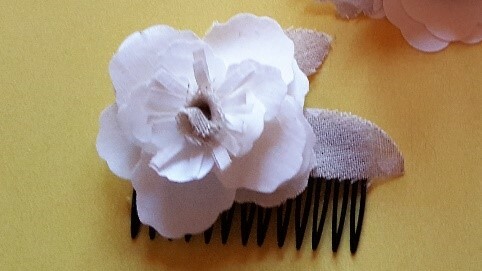 After adding leaves and feathers, I glued the completed piece on a hair band at an angle. 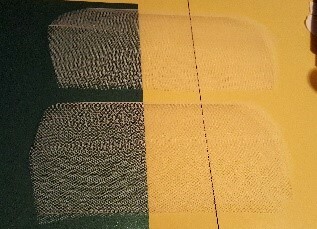 The netting at the front can be turned down to create a veil or turned up away from the face. Here’s what I made with the ‘leftover’ flowers from my experiments. I hope you can see why good flower dies never fail to fascinate. Happy crafting!